Undertale is an RPG available exclusively for PC and Mac, but don’t let that dissuade you. It is by and large one of the most unique games currently available for many different reasons. Gameplay varies tremendously with the situation, but most of the “exploration” takes place in a traditional top down view with four directional movement (diagonals are also included). It’s an entirely different experience than the huge AAA titles (looking at you, Fallout 4), and I love it for that. One of the nicer aspects about a game such as Undertale is its more traditional offline nature. You get to have a solitary experience (the strong-willed can complete a run in a day) and take in the world with no distractions. It’s just you and the game, and that’s refreshing. Without the requirement of an internet connection, you don’t even need to hide yourself from trolls or hackers. Visually speaking, Undertale is designed as a cross between retro 8-bit and 16-bit type graphics reminiscent of the Earthbound franchise. Despite that, the pixel models are selectively very detailed and characters all have unique movements and animations to correspond with their moods and feelings. In terms of creating an immersive environment, Undertale does exceedingly well. Battles are handled on a turn-based system, but don’t let that throw you off. Enemy turns involve dodging a slew of varying attacks in a danmaku bullet hell style of gameplay, minus the need to destroy enemy ships (as seen in games such as Gradius). The biggest difference is on the offensive turn, as there’s more than just attacking or healing. You also have various dialogues and the most central element of the game. Every fight has two options: kill or mercy. Monsters will eventually die if attacked until they run out of HP, but you can also “spare” them by using dialogue options. For instance, early in the game a reindeer with tree antlers appears as a random encounter. Upon use of the “check” command, you see its trees have been decorated and it doesn’t like that. If you spend turns removing those decorations instead of attacking, you can spare the monster without dealing any damage. Given the nature of most games, you might wonder exactly why you would even bother. After all, monsters you don’t “kill” yield no experience points. Yet the game has a few different ways to play. On a pacifist run, you can play to the very end without ever killing a single monster. That includes bosses! If you play your dialogues right, you can even befriend them. Naturally, this also comes with some additional challenges. No killing means no exp, which means you never level up. Not that you’d need to deal extra damage, but that also means you don’t get any additional HP. Playing the game better becomes more important than leveling up, so the game forces you to become better. Unless, of course, you get fed up and decide to start killing everything in sight. 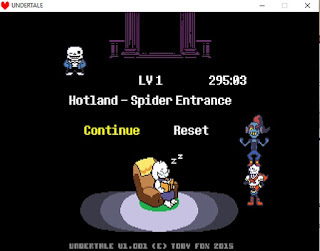 The other way to play through Undertale is often referred to as a “genocide” run. As the name implies, you kill everything you come across. This yields the most exp and lets you level up, giving you more HP to handle enemy attacks. While the genocide run is generally considered easier, it has some interesting effects. Certain fights change when you alter the course of the story by killing everyone. Some enemies become more difficult or more aggressive (as one might imagine). Other fights will take longer (strangely enough) to win if you’re just using attack. 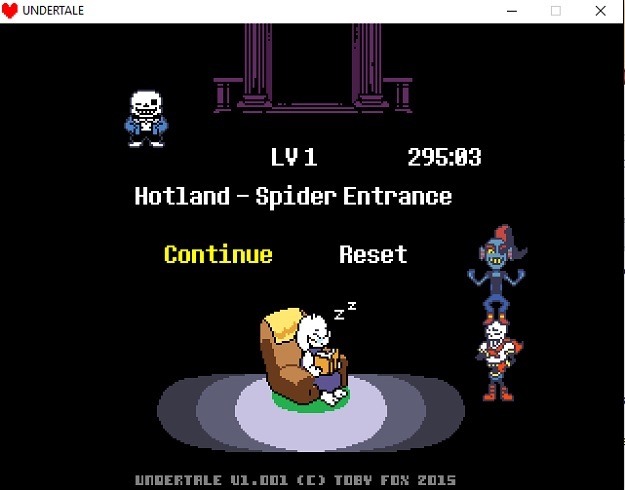 Other than regular battles, there are some other systems in Undertale worthy of note. Outside of battle, there are a number of different puzzles and traps you’ll need to navigate to reach your destination. While most puzzles aren’t incredibly challenging, they do require some thought. A few are timed and will demand some additional dexterity. That means tons of mini-games, so you won’t always be able to rely exclusively on the skills you’re using to battle through the rest of the game. Decision making is important because what choices you make will have different outcomes. This can even include what equipment you’re wearing. Inventory in the game is extraordinarily limited, as you can only carry up to 8 items at a time. You’ll need to choose what you bring with you carefully. Though random battles are somewhat infrequent, you can quickly find yourself in a bad spot if you have no healing items because your inventory is filled with dogs (you’ll understand if you play). It might seem curious to list the plot so late in an RPG review, but that’s only to save the best for last. Undertale’s plot is simple in nature but filled with clever jokes and heavy themes. Within the first few minutes of the game you’ll find yourself cast as a child that’s fallen into a cave. This is a place where, in an ancient war, humans banished the monsters to and sealed them away with a barrier. This is a land where monsters rule. While your goal is mostly to escape the underground and return home, the variety of unique and entertaining characters can quickly make you forget about reaching the end. Recall that your enemies can quickly become your friends, but only if you handle the battles and dialogue right. You’ll quickly learn that the protagonist’s life is incredibly important, even as a child. Undertale is available on Steam and GOG for an affordable $9.99. Due to the different choices you can make in the game, you can get at least several runs out of it. Considering how most modern games run as high as $60 (before the DLC), a ten spot seems like a good deal. Do you have any additional questions about Undertale? If you’ve played it, what did you think of it? Let us know what you think in the comments below! About the Author: Lots of people play video games, and Cassie is no exception. When she’s not slaying dragons or beating her friends, she’s usually writing about tech and gaming online. If you’d like to read more of her work, check it out on Culture Coverage.